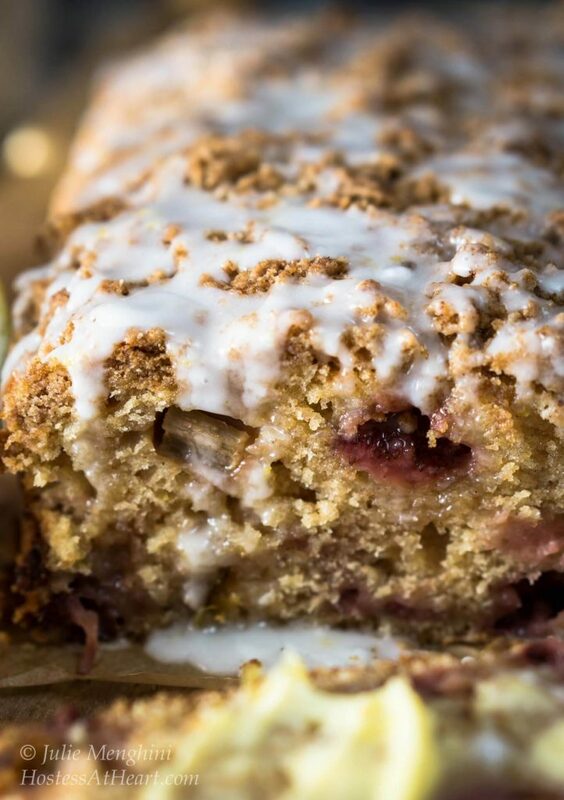 Strawberry Rhubarb Bread with Streusel Topping could easily pass for cake. It is sweet, tart and crunchy all at the same time. It’s perfect for anytime from breakfast to dessert. 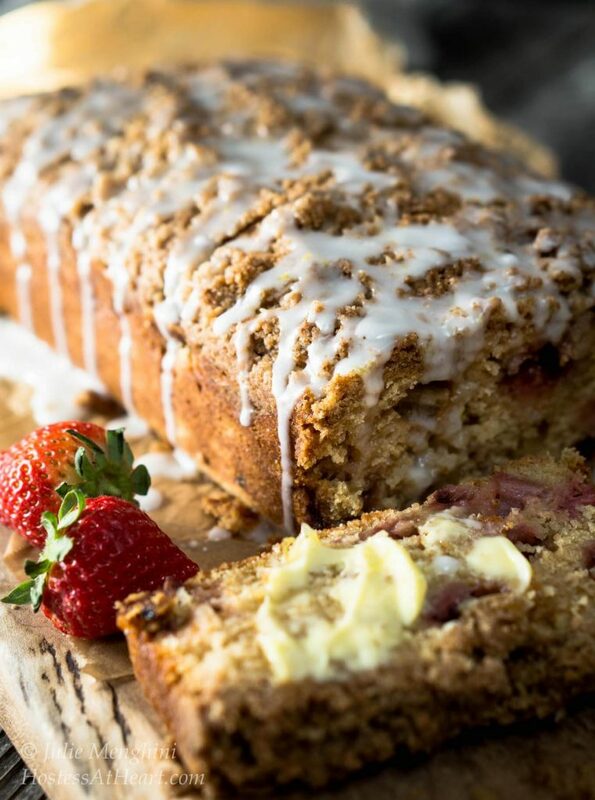 If this Strawberry Rhubarb Bread with Streusel Topping was entered in the County Fair, I know I would walk away with a purple ribbon! How do I know? Experience! True story here. When I was younger, I was in a club called the 4-H Club. This club has all kinds of divisions such as agriculture and animal competitions to cooking and sewing. When the county fair rolled around, we were required submit an entry. I had signed up for a cooking division and specifically wanted to enter my mother’s coffee cake recipe. My entry was due and I had totally forgotten to make it. I remembered it while at a school function, and knew that there was no way I was going to be able to make it! I called my mother and asked her to bake it for me. I knew I would be awarded a winning ribbon because my mother’s coffee cake was the best! Well, karma was not on my side. I (my mother) received a white ribbon, which essentially says better luck next time. I would like to think that I have honed my craft over the years, but like any baker, some recipes are hits and some are misses. This recipe is a hit in every way possible. The crumb is so soft and moist. It’s nice and sweet with a mix of tart from the rhubarb. The streusel gives this bread a delightful crunch, and the lemon just brightens up everything beautifully. 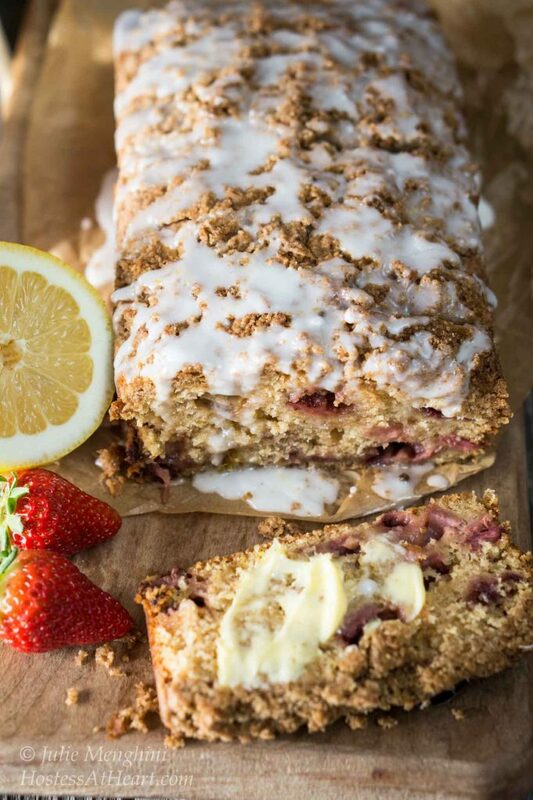 This Strawberry Rhubarb Bread with Streusel Topping could easily pass for a cake. It is sweet, tart and delightfully crunchy and great for breakfast or as a dessert. Preheat oven to 350 degrees F. Grease a 9 x 5 loaf pan. You can also line it with parchment paper as I often do and then spray with non-stick cooking spray. Combine the dry bread ingredients (flour through salt) together in a large bowl. Whisk to combine. In a medium-size bowl, combine eggs, lemon juice, buttermilk and melted butter. Pour liquid ingredients into dry ingredients. Mix until just combined. Fold in rhubarb and strawberries. Pour into prepared pan. Combine flour, sugar, and cinnamon. Cut in cold butter using two forks until mixture is crumbly. Sprinkle over bread. Bake for 55 minutes or until a toothpick inserted comes out clean. Turn pan halfway through baking. Cool completely in the pan on a wire cooling rack. Remove bread from pan. Combine glaze ingredients. Add additional milk if the glaze is too thick to drizzle over bread. Another true story. John wanted to share this with his parents. I said not this time, I wasn’t sharing! Karma will probably bite me for that too! 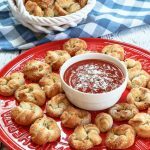 If you’re still looking for recipes, here are a few of my favorites! 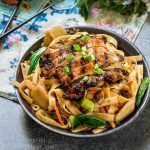 I’ve made this recipe twice before, exactly as is, and the family just loves it. Yesterday I was three quarters into making it again, only to discover at that last step that my rhubarb was rotten…. so, I substituted chopped apples. And it turned out so good! We really love the rhubarb, but the apple is a very close second place option. Thanks for the recipe! Thank you so much, Johanna! I love your idea and apples are so much easier to get year around. I’ll definitely be trying it with apples and really appreciate you sharing such a lovely comment! I love knowing that people are making and enjoying my recipes. Another yummy treat to tempt us! Thank you Patti! 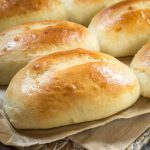 Easy to make and eat. ❤️ Have a wonderful day Patti! That crumbly topping is so tempting. 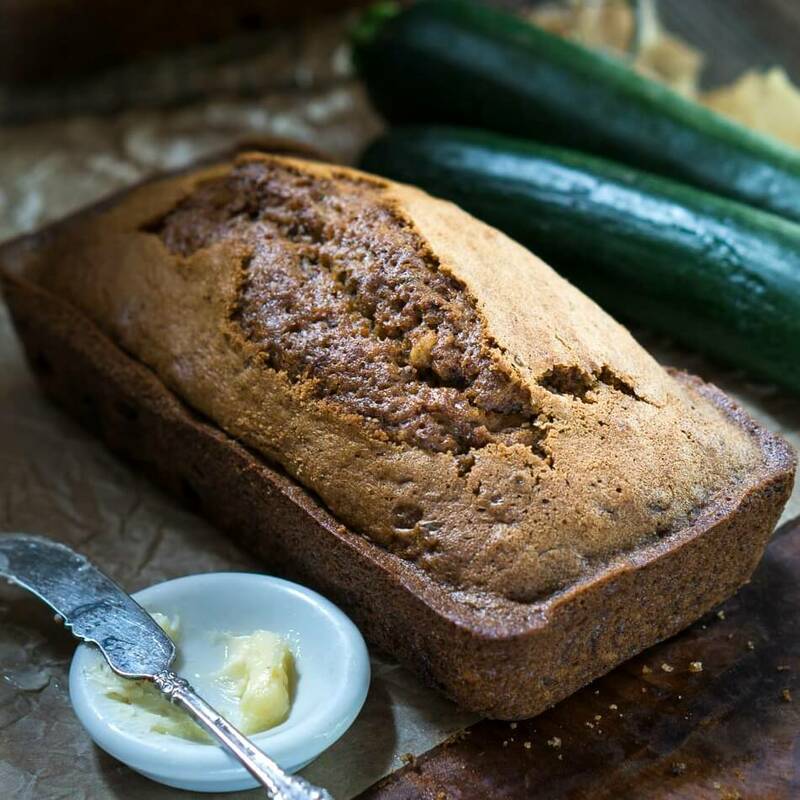 I love that you took so many beautiful photos of this loaf….definitely drool worthy. Thank you Sandi! It is one of my very favorite breads that I’ve ever put together. Can’t imagine this getting a white ribbon! The judges were taste Blind my friend. Seriously how good is this! I love streusel topping. It adds such a perfect crunch to the moist cakes. Don’t get rhubarb here.. Might sway this for strawberry. Ha Swayam! This bread is wicked good Swayam! You cold definitely just use strawberries! Hugs Soul Sister! I will give you a ribbon for this! Plus I would eat the whole loaf! Woo hoo! I pretty much did Jennifer! Your photos are always so pretty and anything with a lemon glaze is sold for me, but the rest sounds great as well. Yum! This looks fabulous Julie! I love strawberry Rhubarb, and that streusel topping with the lemon glaze sounds amazing! I could definitely see myself eating this for breakfast or anytime of day! Definitely worth first place – the list in ingredients is a big draw, with buttermilk sneaking in there alongside the strawberries & rhubarb. 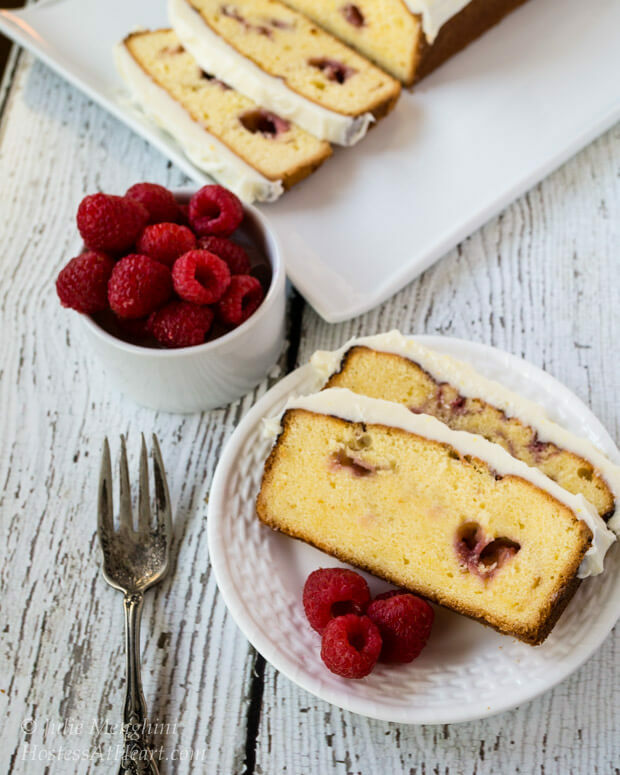 I think the lemon glaze finishes this cake superbly too – it looks divine. Thank you Jane! I almost finished the whole thing by myself! It’s dangerously delicious! Have a wonderful day. i think i would give this bread a thousand purple ribbons (I assume that means first place haha! not too familiar with country fairs!). Ths looks soooo yummy, the perfect mix of flavours and textures – yum! Thank you Michelle! John was gone when I made this bread and I almost ate the whole thing myself! Yea for the purple ribbons!!! Those are the best. Thank you Michele! I think every piece of property had at least 3 plants where I grew up. I’ve tried several times to get my own going and can’t seem to do it. I actually made this bread with frozen rhubarb! It was cleaned and sliced already. Cheat where you can I say! Have a wonderful evening Michele and thanks for stopping by. Hey Julie, great minds think alike. I’m working on a strawberry rhubarb pie for next week. I love the idea of a bread with streusel topping and the addition of the lemon glaze, what a burst of flavors – yum! Thank you Lily! I can’t wait to see your pie! 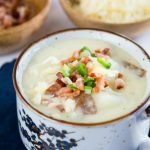 It’s one of my favorite combinations and I love your recipes so I am sure it will become a favorite of mine! What an amazing combination of flavors and textures, Julie! I’m sure you would win a blue ribbon, too! I love it when there are layers of flavors in food. The streusal topping and glaze must send this bread over the top. Thank you for sharing your recipe! Anything with a streusel topping is good in my books! Not sure how your ribbons work but it definitely looks like a winner to me! Don’t forget to link up to Fiesta Friday so everyone else can enjoy the party too! I don’t suppose you’ve any suggestions to make this gluten and/or dairy free? I agree! I just love the stuff on any bakery. I’m not an experienced baker for gluten free recipes but you might try almond flour. Also, replace the buttermilk with applesauce for a dairy free options. What a unique combination of ingredients!! Thank you so much. It is a combination that I just love and just reminds me of spring. I give you the blue ribbon for this recipe myself! It looks absolutely scrumptious!!! I wish I had all the ingredients and I could enjoy this tomorrow morning with a cup of coffee….. Thank you Kloe! I almost ate the whole thing! Thank you Ana! I really enjoyed your post today! OMG, Julie!! Purple ribbon for sure! You had me at Streusel and Strawberry & Rhubarb is such an amazing combination!! Naina you gave me a purple! You rock my friend. Thank you and enjoy your day! This cake looks so beautiful, moist and delicious! Thank you so much Jasline! So happy your stopped by! Ha! I’m a real streusel lover too! Oh my goodness gracious, definitely a blue ribbon winner! Definitely a winner in my book!!! Looks delicious Julie! Thank you Loretta! It’s a dangerous bread to have around. I just about ate the whole thing while John was out of town! Blue ribbon from this judge! Drool-worthy too! Oh my. Woo hoo Johanne! Thank you my friend. Haha, your story made me laugh Julie. That sounds like something that would happen to me. Jess, I made this when John was out of town and I just about ate the whole thing by myself! Hope you’ve had a wonderful day! That’s funny Judi because I made it when John was out of town and ate it for two meals every day. I almost polished off the whole thing by myself.